Superior outdoor cooking with the flavor of charcoal and the quality and convenience of Cuisinart. The Cuisinart GrateLifter Charcoal Grill features a novel cooking grate lifting system giving access to the charcoal bed without having to touch the dirty cooking grate. With the lift engaged, the grate raises effortlessly out of the way when you open the lid — you can also choose to open the lid without lifting the grate. This lets you start the coals, add coals for extended cooking, or brush the coal ash in to the ample collection bin without ever touching the grate! Other features include a large, family-sized cooking surface, precesion air flow system for accurate temperature control, lid mounted temperature gauge, a robust table stand, and an attractive and durable porcelain enamel coated lid. Features: * Unique grill lift system allows access to the charcoal bed without touching the cooking grate * Spacious cooking grate (240 sq. in.) with enough room to cook for your whole family * Large ash collection bin for easy cleaning * Precision air flow system allows accurate temperature management * Built-in temperature gauge in lid. Innovative culinary tools are the Cuisinart signature. The prestigious Cuisinart brand is not limited to their famous food processors – plugged or unplugged, nobody covers the modern chef like Cuisinart. Cuisinart is a full-service culinary resource with a wide array of products, preferred by chefs and favored by consumers. 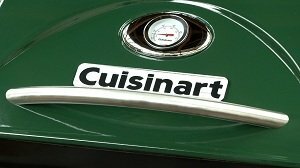 And now you can take the world famous Cuisinart brand to your patio, lawn, tailgate, or campsite with their comprehensive line of Cuisinart outdoor grilling products available now on Amazon. Get great grilling performance every time you grill with the Cuisinart CCG-100 GrateLifter Portable Charcoal Grill. This thoughtful, versatile, ultra-portable charcoal grill is designed with the revolutionary GrateLifter charcoal management system that allows you to maximize flavor while minimizing the difficulties associated with grilling with charcoal. So whether you are tailgating before the big game, camping under the stars, or entertaining friends and family at home, the Cuisinart GrateLifter Portable Charcoal Grill will help you serve up delicious barbecue every time. With a 240 square inch porcelain-coated grill grate, this spacious grill has plenty of room to accommodate lots of food at one time while still distributing heat evenly and efficiently. In addition, the handy integrated precision temperature gauge clearly displays internal temperatures and allows you to accurately manage your cooking. Weighing less than 30 pounds, the grill is ultra-portable — easy to pack up and carry to any social venue where fine grilled food is on the menu. The grill measures 26 x 19 x 18 inches when in grilling mode. The Cuisinart GrateLifter Portable Charcoal Grill is designed for the serious chef and grillmaster — one who understands that grilling over charcoal leads to the tastiest barbecue, and that using a quality charcoal grill will make all the difference. 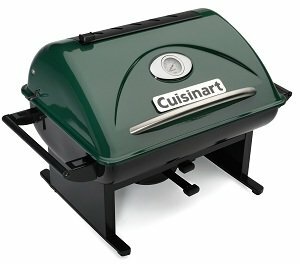 Highlighted by its colorful green enamel-coated steel lid and prominent integrated temperature gauge, the Cuisinart GrateLifter Portable Charcoal Grill promises to deliver exceptional quality that will withstand the elements and survive years of high-temperature grilling. 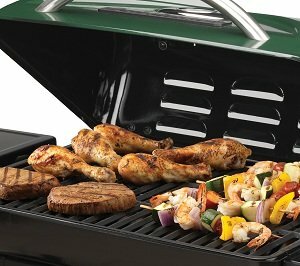 Sturdy one-piece welded grill base is constructed of porcelain enamel-coated steel. This base elevates the grill and holds everything together at an appropriate grilling height. Connects directly to the Cuisinart Folding Grill Stand (model number CFGS-150, sold separately). Grilling with charcoal requires time, patience, and considerable interaction with your grill. To maximize food flavor and tenderness, the master chef must pay close attention to the temperature and understand when to make adjustments. It is both a science and an art… with most chefs having their own personal tactics to achieve the perfect flame. Yet no charcoal grills offer the ability to so easily adjust, add and remove coals as the Cuisinart GrateLifter Portable Charcoal Grill. The innovative GrateLifter mechanism is a novel cooking grate lifting system that gives the chef access to the charcoal bed without ever having to touch the dirty cooking grate. With the lift engaged, the grate raises effortlessly out of the way when you open the lid. This gives the chef easy, safe access to the coals beneath the grate, allowing you to add coals for extended cooking and adjust the location of the coals to help fine-tune direct heating temperatures. This also comes in handy when you want to smoke foods using indirect heating by letting you easily shift coals to the unused portion of the grill. All of this can now be accomplished without removing the cooking grate — even when the grate is fully loaded and cooking! The new GrateLifter system also makes the process of lighting coals simple and clean. Simply light the coals in the firebox with the grate in place. When the coals are hot, use the Lift feature and spread the coals without removing the cooking grate. And when the coals turn to ash, use the Lift feature to raise the cooking grate and brush the ash into the ash tray. It’s simple, easy, safe, and clean. from parties to picnics, tailgating to camping, and more! The Cuisinart GrateLifter Portable Charcoal Grill combines the ideal size of a family charcoal grill with the versatility and compact size for the perfect portable grill. Its spacious 240 square inch grilling surface is ideal for cooking for your entire family, with enough space to cook up to 10 burgers, 8 steaks or 8 chicken breasts. The compact footprint also ensures that this grill will not take up too much space on your patio, like those larger, full-sized grills do. Two removable Cuisinart GrateLifter Side Tables (model number CST-152, sold separately) can provide extra shelf space and come in handy when grilling away from home. 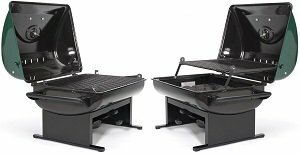 The grill fits comfortably on most patio tables, or docks on the Cuisinart Folding Grill Stand (model number CFGS-150, sold separately) for compact, upright grilling at full-size height. The Cuisinart All Foods Gas Grill Cover (model number CGC-21, sold separately) protects the grill when the grill is not in use. In addition, the GrateLifter is ultra-portable and designed to be the perfect size for all your on-the-go grilling. 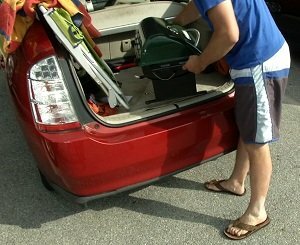 The grill measures only 26 x 18 x 19 inches when in transport mode, weighs less than 30 pounds, and has two integrated side handles making it easy to load in and out of your car or trailer and transport to your desired grilling location. From backyard barbecues, to tailgating before the big game; from parties and picnics, to camping out with friends or family; one thing is for sure — with the Cuisinart GrateLifter Portable Charcoal Grill, your grilling experience will never be the same!